The global mouth ulcer treatment market is expected to be immensely fragmented, and hence competitive owing to the large presence of various global and regional players in the market. Nevertheless, due to not much attention given towards the treatment of the disease, and easy access to over the counter medicines, the market is foreseen to witness a bit of a sluggish growth in upcoming years. Increase in mergers and acquisition activities, along with the launch of new products are the key factors supporting the growth of the global mouth ulcers treatment market. 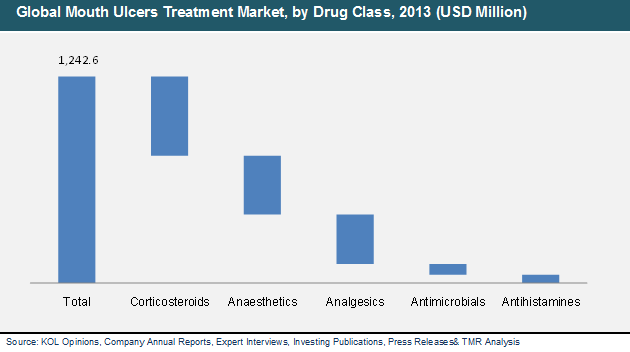 Some key players leading the global mouth ulcers treatment market are Church & Dwight Co., Inc., Pfizer, Inc., 3M, Bristol-Myers Squibb Company, Taro Pharmaceutical Industries Ltd., BLISTEX, INC., ECR Pharmaceuticals, GlaxoSmithKline plc, and The Colgate-Palmolive Company. According to a recent report by Transparency Market Research (TMR), the mouth ulcers treatment market is expected to grow at a steady CAGR of 3.80% within the forecast duration from 2014 to 2020. The market was valued around worth of US$1,242.6 mn, in 2014. This value is expected to reach a worth of US$1,596.9 mn by year 2020. Moreover, advancement in technology along with innovations in the medicine field are anticipated to bolster global mouth ulcer treatment in the near future. Based on formulation, the global mouth ulcers market is categorized into gel, mouthwash, spray, and lozenge. Out of these, the gel segment is anticipated to experience high growth in the upcoming years. Geographically, North America is likely to lead the global mouth ulcers market anticipated to sustain its the leading position during the forecast period. This is credited to the rise in awareness in consumers with respect to easy access to effective treatments to mouth ulcers. Rise in number of geriatric population and high adoption of mouth ulcer treatment products have driven the global mouth ulcers treatment market. In any case, factors, for example, less awareness in some of the developing regions, easy accessibility of substitutes as conventional treatments and ill-effects related with the utilization of mouth ulcer treatment products are pulling back the global mouth ulcers treatment market from developing. Improving economies and socioeconomics conditions in the developing nations, for example, China and India are foreseen to offer great scope in future for the global mouth ulcers treatment market. This is because of growing awareness and rising reception rate for mouth ulcer treatment items in these locales. Be that as it may, changing healthcare policies mandated by different governments and accessibility issues could be significant difficulties for the global mouth ulcers treatment market. Increased awareness about oral health and improved healthcare facilities are driving the market for mouth ulcers treatment in this region. Increased awareness about oral health and improved healthcare facilities are driving the market for mouth ulcers treatment. Improving economies and socioeconomics conditions in the developing nations are foreseen to offer great scope in future for the global mouth ulcers treatment market.